L. Orlik Ltd. was founded as a pipe manufacturer in 1899 by Louis Orlik in London, England. 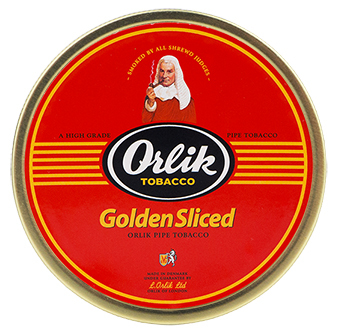 The company used the slogan "Smoked by All Shrewd Judges" along with the image of a judge smoking an Orlik pipe in its marketing material, both of which are still displayed today on Orlik's tins of pipe tobacco. The Orlik Tobacco Company A/S is now under the umbrella of the world's largest pipe tobacco manufacturer - Scandinavian Tobacco Group, which is headquartered in Denmark with facilities across the globe. 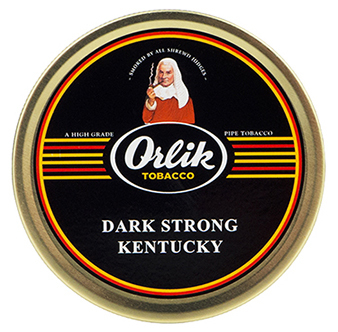 Dark Strong Kentucky is a flake cut, non-aromatic blend of Virginias and dark-fired Kentucky Burley that offers a medium- to full-strength, smooth smoke with a touch of sweetness. Golden Sliced is a mild, non-aromatic pipe tobacco composed of golden and full-bodied mature Virginias from the Old Belt, southern Brazil, and Africa with a touch of Perique. The traditional flake cut tobacco is naturally sweet in taste and aroma.